The members of the Netflix show Queer Eye. Photo courtesy of Cosmopolitan. 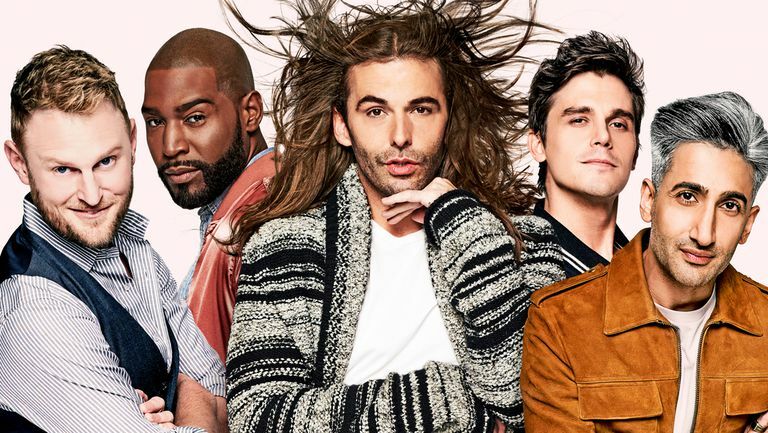 Released on Netflix in February of this year, “Queer Eye” quickly took over the internet and developed a massive fanbase. For the reality TV enthusiast, this binge-worthy original offers everything you need — home improvement, style makeovers, do-it-yourself cooking and heartwarming lessons in self-care. But most importantly, this reboot of Bravo’s 2003 “Queer Eye for the Straight Guy” is all about acceptance of queer culture and of oneself. It addresses heavy topics like masculinity, gender expression, racism and self-esteem while maintaining an upbeat and light-hearted tone. The series follows a group of well-kept and handsome men known as the “Fab Five” around Georgia as they makeover men nominated by friends and family. The Fab Five consists of experts in five different categories — Tan France is in charge of style, Jonathan Van Ness handles hairstyle and overall grooming, Antoni Porowski is the foodie of the group, Bobby Berk is the interior designer and Karamo Brown specializes in culture or the discussion of any somewhat difficult topic like politics or self-esteem. So, in celebration of Karamo Brown visiting campus this week, let’s determine which of the Fab Five we are most alike. FYI, there are no bad answers. Do your friends often come to you looking for advice and a good heart-to-heart? Do you have a passion for politics and activism? Well, it’s safe to say you are Butler’s resident Karamo. You always know what to say to inspire your fellow Bulldog and go through life with the confidence we all aspire to have. Despite your youth, you have the wisdom of a well-seasoned adult. Oh, and satin varsity jackets. You have one in every color. Alright fashionistas, this one’s for you. Always putting your best foot forward, you never leave your dorm looking less than fabulous and aren’t afraid to rock a Hawaiian shirt. Your hair is always perfectly — and somewhat suspiciously — coiffed into style, and your pants flawlessly tailored. You’re just the right amount of sweet and sassy while maintaining your professionalism. Therefore, you are definitely Tan. Not sure how to spice up a look? French-tuck it. You’re the mom of your friend group while simultaneously being the life of the party. You’re known for your luscious locks and your pop-culture quips. You love working a top knot and the occasional kilt, and you never dull your personality for anyone or any reason. Jonathan wouldn’t hesitate to consider you two spirit animals. Love trying new healthy recipes and hosting guests? Are you a total avocado junkie and wine connoisseur? Well, it looks like you may be an Antoni, then. You have perfected that sultry smoulder and fooled everyone into thinking you’re a full-blown chef. Stuck in your teen-angst phase, a subtle graphic tee paired with grungy jeans is your go-to look. And last but not least, Bobby. You may be the more soft-spoken member of your crew, but your refined work-ethic speaks for you. You also have an affinity for interior design, and Home Goods is your favorite store by far. You can make even the most drab space into a cozy yet sophisticated place to hang. But you’re not so one-dimensional. Though you fly under the radar, you could be considered the linchpin of your group.